My very first hooked rug created in 1990. The rug above is my very first project. I went off to a meeting of the Nova Scotia Rug Hooking Guild at the Tatamagouche Centre and Marion Kennedy sold me a kit and and taught me how to hook rugs. As I was hooking, she pointed out some mistakes I was making and I asked her, “Should I pull it out and start again” She said, “Don’t do that you will learn as you go along. Finish it, that’s your job, finish it.” With less than three square inches of the rug hooked this seemed like a dauntingly job but it wasn’t. It turned out that as I kept at it , I learned as I went along. I kept her voice in my head, “finish the mat” and I finished this first project with in a week, and quickly moved on to design my next rug. Rug Hooking is a simple craft that you can easily teach yourself. I recommend a kit for beginners because you have everything you need to get started.Here are some basic instructions for rug hooking. You can also learn lots more through our online courses or studio workshops. 1. You first fasten your pattern, which is a piece of burlap with a picture drawn upon onto a frame such as a heavy duty quilting hoop, or a stretcher bar. 2. Cut a strip of wool cloth about one quarter an inch wide, and about eight to twelve inches long. 3. Hold your hook in the hand you use to hold your pencil, and the strip of wool in the other hand. Put your hook down through a hole in the burlap backing, and catch the piece of wool, pulling it up thru the burlap. Bring the first end right up through, then continue the hooking pulling it up loop by loop. 4. In primitive hooking , you generally start by outlining an area and then filling it in. 5.Continue hooking until the whole mat is done. Bring all your ends of wool to the surface and clip them evenly with your loops. 6.When you finish your project, cut the excess burlap away from the edge, leaving no more than two inches all around. Use this to bind the rug by folding it and sewing it along the backside of the rug. You can also use cotton twill tape to bind it along the edge. You can also learn on our online courses or studio workshops. Is your hook that you use all the time called a Moshimer medium? sizes 7 & 8 strips. The larger the number , the wider the cut. Deanne, What do the numbers used with width (maybe?) of wool used in a project? I find this frequently and need clarification. Thanks again for your help. Even though I have now done quite a few rugs,it is nice to go back and read again what I need to do. Being self taught is a hit and miss but my friend say’ there are no rules’ . This lets me be free to explore more on hooking without feeling like things are not right. Sandra, I did put up a new custom kit for larger rugs for people. We might come up with something small based on that one. I shall see. We put up two new kits today. I like the new look to the webpage! I also really love your “Scatter Seeds Wherever You Go” rug. The colours are so vibrant and the woman so joyful. You mentioned in a previous blog that you would be designing new kits. Any chance you will be making a kit inspired by this lovely creation of yours? Thank you for the generous collection of information and inspiration. Your beginners guide is really helpful and I shall pass it on to all newcomers to our rugmaking group with details of your website. I look forward to getting your news each month and am glad your on-line course has taken off well. Keep up the good work Deanne. 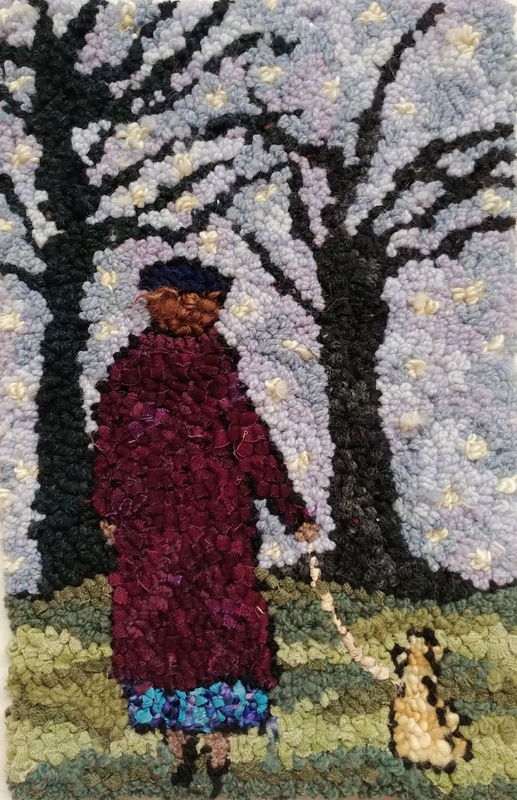 you have been my inspiration for rug hooking after accidentally finding your shop on a trip to my favorite corner of the world. We have been lucky enough to travel to N.S. 4 times and I am hoping for another trip soon. Meanwhile, thank you for the wonderful site via the internet. When people express an interest in this fabulous art/craft, I recommend your site for info and encouragement. Keep on hookin! “Finish it, that’s your job” – easier said than done but just what I did yesterday! Two years ago I purchased my first kit from your shop in Amherst, one of your Big-Boned Girls, and for almost a year it has been waiting for me to finish the edges but after taking Deanne’s very stimulating first online rug hooking course this winter, I just wanted to get started on about 19 new projects (after hitting all the local thrift stores for wool jackets, skirts, and anything I could get my hands on and then organizing it on newly arranged shelves – another online course suggestion) and wasn’t completing anything. When I decided I wouldn’t give myself permission to start a new project until I finished my others, I picked up the Big-boned Girl, added a border, stitdched the edges down and am thrilled with it – took a picture too (just like Deanne)! Your blogs are magnifico. If this one doesn’t get the would be rug hookers going, I don’t know what will. You motivate one to strive hard with what ever creative instinct they may have. I am enjoying the latest UTube demonstrations they bring you closer to your fellow hookers.